Panasonic specialises in laptops for those who need to take a computer into some of the world's most extreme weather conditions. This could be up a telegraph pole, a mountain or down a sewer. The military is also a user of machines such as the Touchbook CF-30 (£2,971 inc. VAT); hence, it is built to meet US military standard MIL-STD 810F and it's the toughest system we've seen to date. The standard dictates a laptop must be able to withstand extreme temperatures - both hot and cold - vibration, repeated drops and various weather conditions. To this end, the chassis is a sealed unit, preventing moisture from causing problems. All of the ports are sealed behind rubber or metal panels, and you'll be able to use the Panasonic in any conditions. The chassis, screen surround and hinges are made from a tough magnesium-alloy. Only the buttons and screen are made from plastic. A downside to such impressive build quality is a bulky overall weight of 3.9kg. Being a sealed unit, the last thing you'll want to do is let moisture in when changing batteries, so Toughbooks tend to have a longer uptime than most laptops. This was certainly the case with the CF30, as we managed to get 422 minutes from a single charge. It is highly unlikely anyone will need to work in extreme conditions for longer than seven hours, but if this happens to be the case, this machine will accommodate it with ease. Sealed units cannot use fans, as vents would be needed to expel warm air, which lets possible moisture get in, so the use of low voltage components is required. To this end, Panasonic has opted for the Intel Core Duo L2400, which generates less heat than standard chips. On the downside, performance isn't cutting-edge, but we found it was adequate for everyday tasks. Although the chassis is compact, the keyboard stretches right to the edges of the chassis, resulting in keys that are easy to use. As with the rest of the machine, they're well attached and waterproof. The screen is a 12.1-inch TFT display that is bright and highly viewable from a range of angles, though images proved to be slightly hazy. This is a result of it being a digitised panel, which allows field workers to enter information with a stylus. 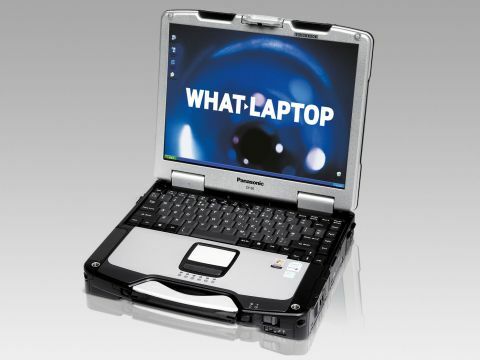 The Panasonic Toughbook CF-30 is a great example of a laptop for niche purposes. The rugged outer shell is where most of the money has been spent, but we found the components inside lived up to expectations. This isn't a laptop for everyone, but if you need to work outside for a portion of the day, it's worth considering.